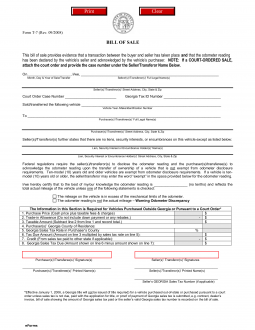 The Georgia Bill of Sale Forms are legal documents used by entity and individual or two individuals, for the purpose of proof of sale and purchase. They are also used to provide and prove change of ownership. Some of these documents require notarization. If this is the case, be certain that all parties involved are present before a notary prior to the provision of any signatures. Boat Bill of Sale – This document would be used to offer proof of purchase of a vessel/boat and change of ownership for registration. General Bill of Sale – To be used, generally between two individuals, to offer proof that an item or items being sold or traded has taken place. Firearm Bill of Sale – Used to show proof of purchase or trade, as well as a change of ownership, of a firearm if needed. Vehicle Bill of Sale (Form T-7) – Transfers the possession and ownership of a motor vehicle. Required for the new owner to obtain title. If you would like to purchase a firearm and you reside inside of the state of Georgia, if you purchase from a dealer, you will have to provide identification and you will have to have a background check. If you’re purchasing from an individual, there is no background check requirement. In the state of Georgia, if you would like to sell a firearm to anyone, there are no restrictions and no background check required. It is believed in this state that one is welcome to sell their personal property to whomever they choose, however, if you knowingly sell a firearm to a known felon, you will be held responsible for such action. This act in itself, is also considered a felony. You will need to complete a Tag/Title Application (Form MV-1).